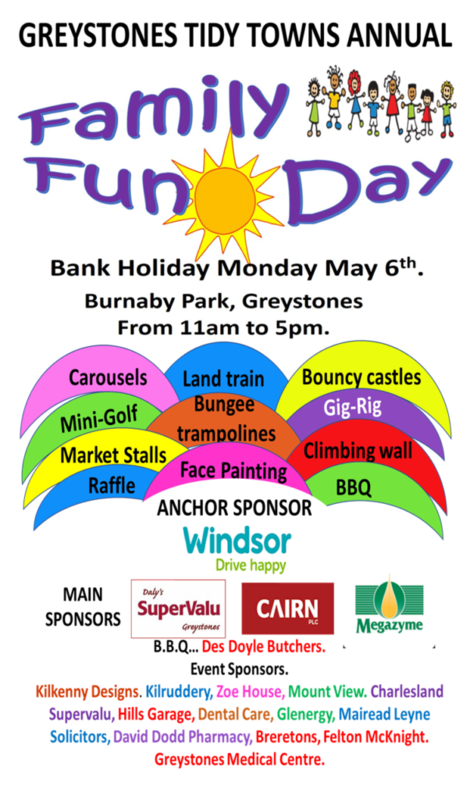 “Save the Date”… Monday, 6th May 2019, May Bank Holiday is our annual Family Fun Day!!! Fun for everybody, bring your friends, parents, grandparents, grandchildren (even bring the dog..on a lead of course). Games, food, markets and entertainment all day. Greystones Tidy Towns and Council work together to install a public drinking water refill station at Barnaby Park. More stations to come! A revitalization of the Greystones DART station and the Barnaby Park plantings is also underway! Winner Bronze Medal – Tidy Towns 2018! Thank you to our volunteers and community-at-large for making this big win happen! Congratulations to all of the other winners across all of the categories. View the official results here. County Winner of the National Lottery Good Causes Awards 2018! Greystones Tidy Towns is made up of a committed group of volunteers whose mission is to keep the beautiful town of Greystones as clean and tidy as would be expected of the town that won “World’s Most Livable Community” in 2008. We have also taken on a role as a community educator and advocate for sustainability, biodiversity, preservation of local heritage, and “smart cities”. Join us if you want to help make a difference and an impact in this wonderful community. We invite you to visit our site and find out what we are all about. You will see what projects we are currently working on, news, events and what we have planned for the future and some of our finished projects. Take a look at the following video for more about Greystones Tidy Towns with special friends from the Happy Pear and Daly’s SuperValu. Welcome to the website for Greystones Tidy Towns! My name is Marie McCooey and I am proud to be continue as Chairman for Greystones Tidy Towns. Greystones as we all know was voted as one of the Worlds Most Livable Communities to live in 2008. We would like to think that it would still win that prize if we were to enter the competition again. Greystones Tidy Towns is proud to play its part, along with the many other local organisations which make such a great contribution to the town’s high quality of life. Chairman of Tidy Towns is a role I am looking forward to tackling and have great hopes for our future in the Tidy Towns competition. We cannot and will not do well in the competition without the whole of Greystones being involved. We want to get the idea across that “Tidy Towns” is not just for the couple of weeks the judges are around. It has to be a year round effort on all our parts to keep our town looking as neat and tidy as we would our own homes. An extra effort is needed just before the judges visit, like we would spring clean our own place before important visitors. The Greystones Tidy Towns Committee would be delighted to hear from you: feedback, comments or ideas. In particular, we would love to hear from you if you would like to volunteer.